The Cubs’ rebuilding process reached fruition when the team won the 2016 World Series, but the physical rebuild of the team’s ballpark, the Friendly Confines of Wrigley Field, soldiers on as part of a multi-year redevelopment. Now that the Cubs had finally won it all, what was to become of the culture surrounding the team? John Long, a manager at Rockit Burger Bar across from Wrigley Field who has worked in Wrigleyville for over 17 years, described how the feeling for fans has changed, even when the Cubs didn’t make to the 2017 World Series. Within Wrigleyville too, there was renewed hope. “The energy was so high. There was a very surreal feeling. A lot of pride in the neighborhood,” said Kelly Mika Renea, who has worked as a bartender in the area since 2010. And as the construction continues, renewed faith and interest in the team from fans leads to hope for more revenue. Timeline: Explore the ballpark’s renovations. When the Rickett’s purchased the Cubs in 2011, they immediately began to lay down the groundwork for a $750 million renovation of Wrigley Field and the surrounding areas. The renovation project, dubbed the “1060 Project” included both changes in and out of the ballpark. Changes to the ballpark included two videoboards in the outfield, a new 30,000 square-foot clubhouse, structural upgrades to the façade and concourse, and improved seating for the fans. Around the ballpark, an entertainment complex the Cubs call “The Park at Wrigley” was just recently completed, and a hotel is planned to open in the area as well. In more recent years, some businesses have also begun to take more interest in expanding the area, encouraged by the win and renewed interest in the team. 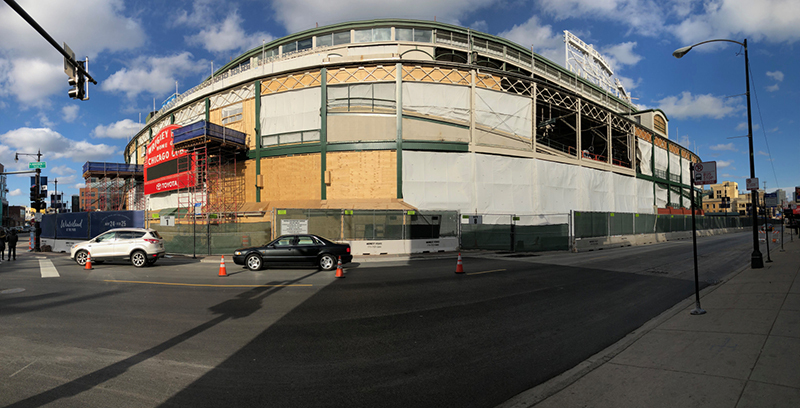 In its hundred-plus year history, never before has Wrigley gone through such a radical change. While the overall presence of the ballpark has not changed, it certainly isn’t the same it was, even five years ago. Some welcome the changes with open arms. For fans, especially those who live outside the area, these changes, especially those in the ballpark, lead to a better game-day experience. Others, especially those running businesses in the area, are more critical of them. Part of that is due to competition. After a lengthy court session, the Cubs agreed to downsize the boards slightly, winning the suit by making the argument that the rooftop owners had no right to profit off the games. The Ricketts then proceeded to buy out each rooftop, to ensure full control of the surrounding spectator areas. This has a serious impact on the people in the area as well. This became a common theme as time went on. More and more property was being bought by the Ricketts, even including the once-famous McDonalds across the street from the field. Some local business owners have even redubbed Wrigleyville “Ricketsville” to show their frustrations. Other complaints from people in the area are driven from the increase in new businesses. Though some of these new establishments are partnered with the Ricketts, others are independent. Either way, they have undoubtedly marked a change to the character of the neighborhood. Some of the new properties added include traditional sports bars and taverns, such as the Budweiser Brickhouse Tavern and Lucky Dorr. But there is also an increased push to create the neighborhood as a year-round destination, with attractions that bring in people beyond game days. One of the areas seeing the highest concentration of development is the Addison & Clark project, which is opening family-friendly entertainment and broad appealing establishments. Some of these new construction projects include apartments, a movie theater, a health club, a bowling alley, a burger joint and a Harley-Davidson motorcycle dealership. By spring, developers also plan to open the hotel on the former site of the McDonald's. Farmer’s markets started this past season when the Park at Wrigley opened across from the hotel site. The site currently hosts a skating rink and a holiday market. A primary question that drives debate about the area is "What is best for Wrigleyville?" Should it focus on retaining history, or attracting more fans? Both can be spun in negative ways. It could be said the history is outdated and won’t lead to increased interest, development, and economic success for the area. Or it could be said that appealing to fans just means appealing to tourists and selling out the original character of the neighborhood. Looking at the new construction especially, some residents are uncomfortable with the drastic shifts happening in the neighborhood. While some infrastructure shifts like the Park at Wrigley open up the area and might be appealing to fans, others, like the businesses and the construction can be detrimental for the long-time residents in more ways than just changing the view or more noise. It might also force them out entirely. That tax increase and change in the makeup of the neighborhood has already put pressure on many established small businesses, such as Luis’ Auto Repair. After considering a deal to sell their property on Addison Street, it is likely the repair shop will close for good. For residents, there are even fewer options, with most simply having to move. Still, not all parts of the area are doing poorly. In fact, many long-standing bars and taverns are still doing very well. “All the bars in the very immediate proximity of the field that have gone up during the construction have barely any business at the moment while the local bars that have been surviving and striving actually are doing much better,” Renea said. So there still remains a great deal of appeal for fans to older establishments, even with the competition from new ones. But it still is up in the air what impact these changes will have in the long run for the neighborhood. “I think it’s going to help the Cubs immensely," said Long, who added he was still a bit skeptical on the shift. "The rest of Wrigleyville? For lack of a better term, the mom and pop bars and restaurants and even the corporations there? How will it help them? That remains to be seen.